Nevin Smith has spent his life growing plants and exploring the wild California landscape. A highly respected horticulturalist and practitioner who is also a gifted writer, Smith shares his years of experience growing native California plants in this lively, informative book. Rather than being a systematic “how-to” manual, Native Treasures combines Smith’s personal thoughts, sometimes maverick opinions, and matchless expertise with practical advice on selected groups of native plants and their culture. The author explains how California’s diverse terrain, climate, and geology support a wealth of plant species—more than 6000—and offers suggestions for designing with most of the major natives in cultivation, as well as with some more obscure but garden-worthy groups. 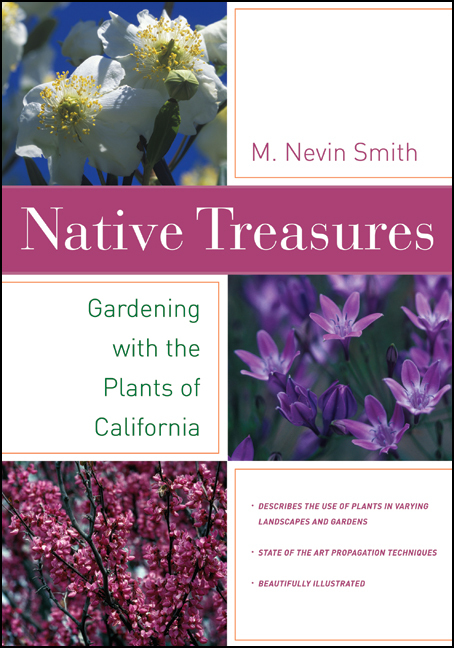 With an engaging narrative and a wealth of illustrations, this ode to beauty and diversity celebrates California’s rich store of native plants and encourages readers to visit them in their native haunts and invite them into their gardens. Nevin Smith is Director of Horticulture at Suncrest Nurseries Inc. in Watsonville, California and an occasional columnist for Fremontia, the journal of the California Native Plant Society.